Turmeric has been around for hundreds of years, adding an intense sunshine yellow colour to anything it touches. Apart from its signature golden hue, turmeric has a plethora of different benefits and has, in recent years, been widely embraced by the health community. Its proven to be a powerful anti-inflammatory, anti-septic, blood purifier, skin tonic and a supplement to aid digestion. Turmeric is no longer just reserved for curries, but is now being incorporated in so many diverse ways. Turmeric lattes, teas, salad dressings, granolas, smoothies, cakes and even turmeric infused gummy candy! This florescent yellow root is taking the foodie scene by storm and is something that I think chefs and home-cooks alike should explore this month. 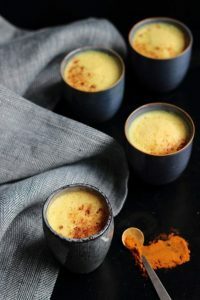 As its Winter here in South Africa, how about trying a roasted cauliflower, cumin and turmeric soup or a warming spiced turmeric latte with ginger, honey, cinnamon and coconut milk. 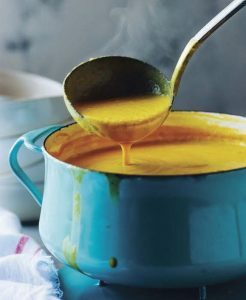 There are so many delicious new ways to use turmeric, without discrediting the more traditional, and arguably most tasty, ways. A spicy eggplant curry, saag aloo potatoes or tender curried fish, are all recipes one could deem “oldies but a goodies”. Whether its more traditional or something trendy and fresh, definitely give turmeric a try this month!